Shares of MRF slipped 4 per cent to Rs 57,097 apiece on BSE in the intra-day trade on Friday after the company posted 18 per cent decline in net profit at Rs 279 crore for December quarter (Q3FY19), due to higher other expenses. It had reported a profit of Rs 341 crore in a year-ago quarter. Operational revenue grew 6 per cent at Rs 4,034 crore against Rs 3,799 crore during the corresponding quarter of previous fiscal. 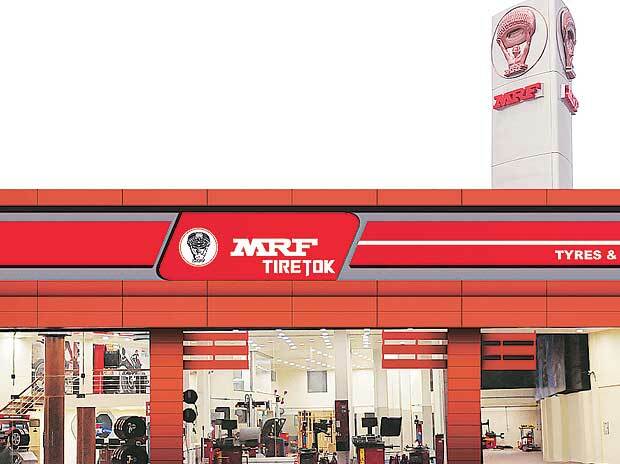 MRF’s revenue growth would have been impacted to some extent due to market share loss in original equipment manufacturer (OEM) segment and a slowdown in light commercial vehicle (LCV) and farm tyre replacement segment in which MRF is a market leader. EBITDA (earnings before interest, taxation, depreciation and ammortisation) margin dipped 30bps quarter-on-quarter and 480bps on year-on-year to 13.7 per cent. Analysts at Elara Capital believe post capacity ramp-up, MRF would continue to benefit from robust truck and bus radials (TBR) replacement growth expected in the next couple of years and market share gains in truck and bus bias (TBB) segment. “We expect margins to bounce back in Q4, with the reduced raw material basket. We reduce FY19-21E EPS by 12-14 per cent owing to volume and margin cuts. With a higher contribution in the replacement segment as compared to peers, we believe MRF to outperform in an environment of slowing OEM growth in FY21E. The market share loss in the OEM segment and slowdown in replacement segment remains key risk,” the brokerage firm said in result update. At 11:34 am, MRF was trading 3.6 per cent lower at Rs 57,500 on the BSE. In comparison, the S&P BSE Sensex was down 0.56 per cent at 36,764 points. A combined 10,439 equity shares changed hands on the counter on the BSE and NSE so far. MRF has slipped 29 per cent from its recent high of Rs 80,821 on July 27, 2018, against a 2 per cent fall in the benchmark index.